For too long, the elves of the multiverse - be they Eldar or House Elves, Drow or Fae - have been cruelly oppressed. In their own stories they are attacked, injured, even killed. In the OFUs, they are forced to teach malicious students - or, worse, are forced to be such students, punished and tortured at the whim of the university's' masters. And should the Protectors of the Plot Continuum class them as 'Mary-Sues', those vicious Assassins in black will hound them, hunt them, and murder them. This cannot go on. 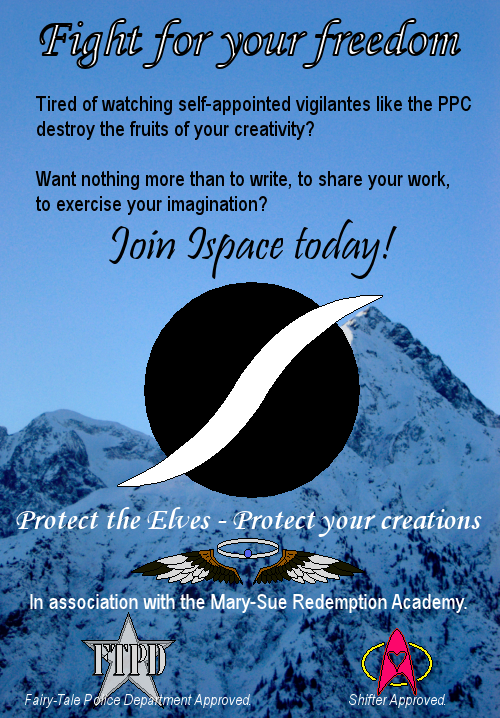 Without the elves, the human imagination will fail. The multiverse will go the way of reality television - mind-numbing deserts of flat characters, endless seas of tedium. Without the elves, all of fiction will fail. We know - we have seen it. We are Ispace. And we will not let this go on.